Disinvestment, deterioration, and conflicting visions have marred Rochester's downtown for more than two decades. 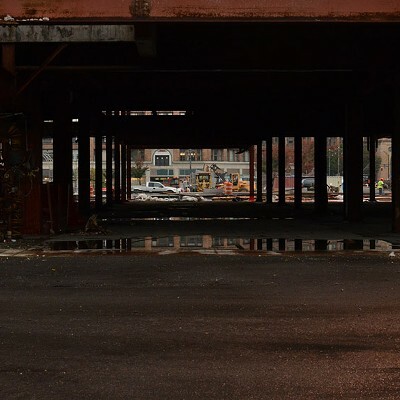 For years, Rochester's main corridor has, for the most part, seemed vacant and lifeless. Major retailers folded up shop. 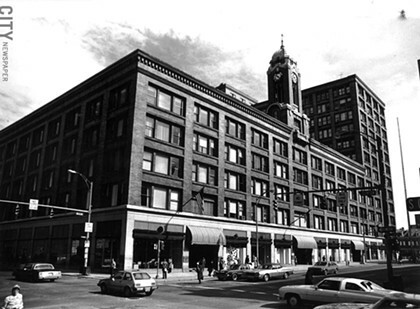 Sibley's and Midtown, once the epicenter of the city's vibrancy, languished, doing relatively little to attract people downtown or to bring in revenue for the city. And more recently, all of Midtown with the exception of the tower was leveled. Even now, first-time visitors to downtown are often dismayed by what they find. But that could be about to change. Developers are sinking millions into the Sibley building and Midtown tower to transform them into hefty mixes of retail, office, and housing. The significance of the undertakings can't be overstated; the two projects promise to give downtown's revitalization a giant, long-awaited kick. It's unlikely this will mean a return to the bustle of shoppers on Main Street. 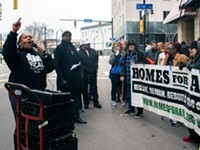 But some city officials say it could lead to further development, including at the northwest corner of East Main Street and North Clinton Avenue, the site of the failed Renaissance Square project. 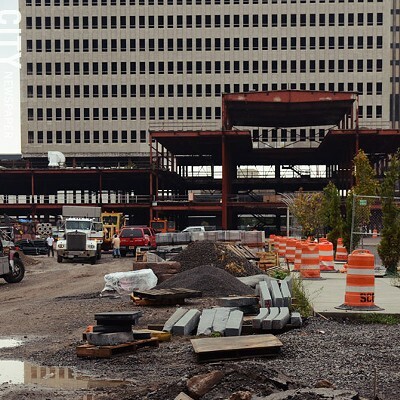 "People are very upset about the northwest corner, going all the way to the Granite building," says Heidi Zimmer-Myer, president of the Rochester Downtown Development Corporation. 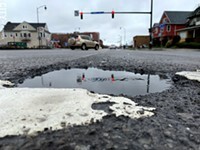 "People are upset about the state of that part of the city. And people identify with it emotionally." The redevelopment of the Sibley building and Midtown tower will help transform downtown into a 24-7 environment. A larger mix of residents and workers means that the streets won't be quite so dark and empty after the offices close during the work week. 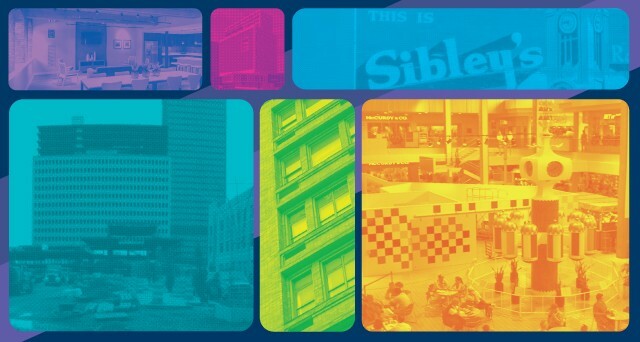 No building in Rochester, except perhaps the old Midtown Plaza, inspires as much nostalgia and affection as Sibley. Once a marquee shopping experience, especially during the holiday season, Sibley suffered along with the rest of the city during the post World War II exodus to the suburbs. The downtown building closed in 1990, then limped along in the custody of an apathetic owner until WinnCompanies came calling in 2009. The sale was completed in 2013. 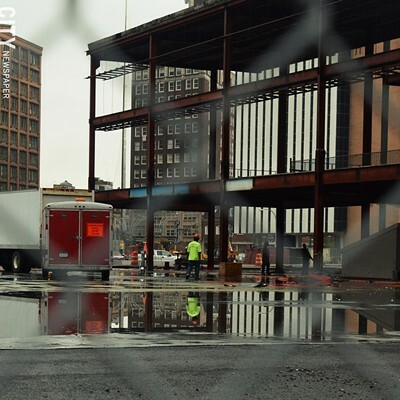 The Boston-based company is redeveloping the building for retail, offices, and housing. A new child-care center is already operating, and a police substation opened on the building's first floor. Winn has also made some external improvements, such as adding new awnings. Winn installed a new security system with a total of 57 cameras inside and outside the building. It has also started redoing the building's main atrium and has put in a couple of historically sensitive escalators. 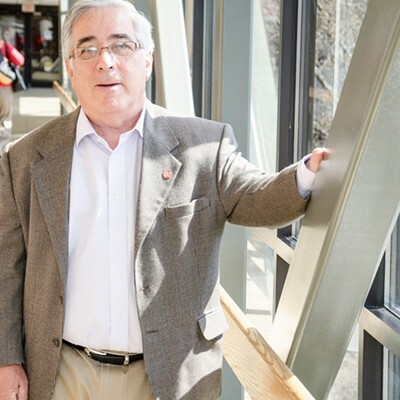 "The cool thing about Sibley was they got the first of everything," says Joseph Eddy, vice president for WinnDevelopment, the real estate development arm of WinnCompanies. "The bad thing is it's all still here. It's, like, 1950's HVAC. Really, 1930's escalators. 1930's electrical grid." Eddy says Winn is marketing the building locally and nationally. "You cast a wide net," he says. "We're aggressively looking at tenants. We'd expect to have retail tenants in the building that support both office and housing tenants, such as a coffee shop, medical and dental offices, an offsite dry cleaning, restaurants, and bars. We want to attract retail that attracts people back to Rochester. That means the retailers should be unique." 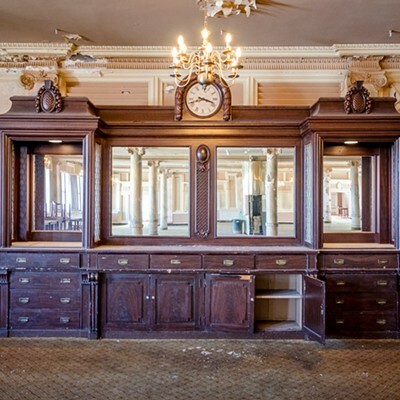 The building is on the National Register of Historic Places, which means there are certain features — this hallway, that door — that must remain intact. Developing the building around those features is a challenge, Eddy says, as is the size of the structure. 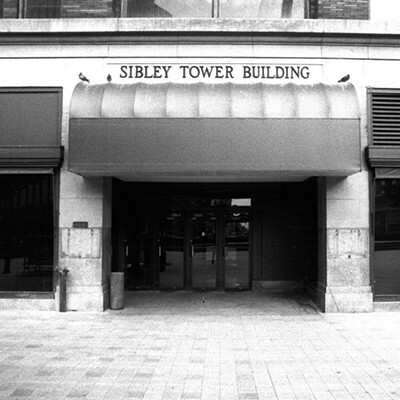 The Sibley building occupies 1.1 million square feet on Franklin Street, at the junction of East Avenue and East Main Street. "It's really the heart of your city," Eddy says. "This is Rochester, right here. We look at it as, you're on the corner of East Avenue and Main Street, and it's really where the common man met the rich man." Winn will develop 91 mixed-income senior apartments in the project's first phase and 100 market-rate apartments in the second phase. They will be mostly one- and two-bedroom apartments, but there will be handful of three-bedroom apartments, too, Eddy says. "We're still finalizing our design for the apartments," he says. "But we expect the amenities to be similar to most of our apartment communities: community lounge, workout facility, theater room, and rooftop garden." The second phase also includes 50,000 square feet of office space, 10,000 square feet of retail, and a farmers market. The third phase adds 50,000 square feet of retail and 150,000 square feet of office space. The fourth and final phase is the redevelopment of the 225,000 square feet currently occupied by Monroe Community College on the fourth and fifth floors. MCC has three years left on its lease, and then plans are to move the college out to the Kodak building on State Street. Eddy says Winn will look for another institutional tenant to replace MCC at Sibley. There will be parking underneath the building for the people living in the Sibley apartments and limited parking for office tenants. The goal, Eddy says, is to break ground on the first phase of the $200 million project at the end of the year, with completion taking 10 years. 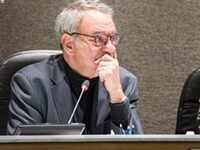 Neither the RDDC's Zimmer-Myer nor those involved in the downtown housing market are too concerned about filling up Sibley's new housing units. 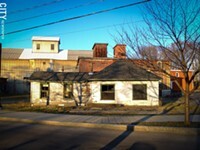 The downtown housing market, as well as the market in certain neighborhoods such as the South Wedge, is hot. 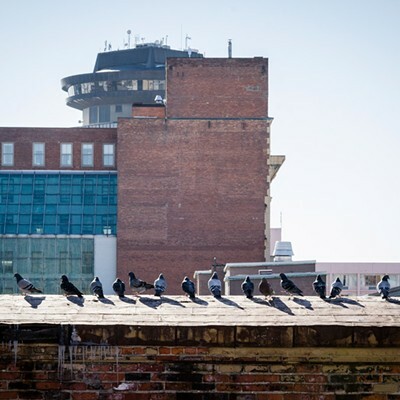 Downtown's residential population grew by 11.5 percent from 2000 to 2010, the RDDC says, and many property managers say that vacant units fill in under a month. The vacancy rate for market-rate rentals is 4.9 percent — a 2.3 percent decrease from August 2012. Zimmer-Myer has spoken many times about the demographic shift happening in cities across the country. Baby boomers, childless couples, and young professionals in particular are increasingly interested in an urban lifestyle. 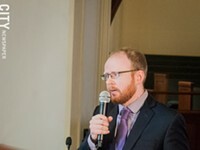 The trend is apparent in major cities such as Boston, New York, and San Francisco, Eddy says, but also in next-tier cities such as Pittsburgh. "Rochester is just going to be the latest example of that," he says. Eddy is also betting that the Sibley name and the building's location will appeal to prospective tenants. "It's amazing how much people love this building," he says. "We've never worked on a building where people care so much. You can see why. It oozes history." 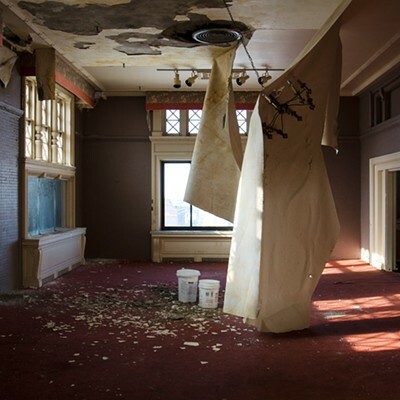 Sibley's future office space is a bit of a different story. 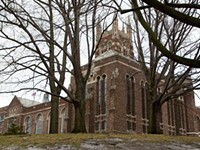 The limitations imposed by the building's historic designation, coupled with Sibley's size and layout, translate to an opportunity that won't be appreciated by everyone, Eddy says. The office space won't have an abundance of window area, Eddy says, and it will have comparatively huge floor space. "We understand we're not going to get a certain type of tenant because they want a lot of window area to square footage," he says. "We're going after the tenants that want these large floor plates, that want to be on one floor. It has that innovative feel. We've seen a lot of that in Cambridge. They want to be in historic buildings, and they love these large floor plates." The Windstream company is using the bullpen layout at Midtown, Zimmer-Myer says, and Windstream's CEO says the layout fosters creativity. "It makes it more of a team atmosphere," she says. "You don't have to change floors or go through doors to different offices. And if you do it properly, you can still have sound control, enough privacy for people." The vacancy rate for premium office space downtown, which is the kind of space that will be available at the Sibley building, is 22 percent — a scary number on the surface. But Zimmer-Myer says the rate includes some large properties owned by people from outside the area who aren't as motivated as local property owners. And like the demand for housing, she says, demand for office space in the city is picking up. It's surprising, she says, because most experts thought retail would follow housing, but instead, office space has been the next pin to fall. "We thought, 'Well, those guys will be the last to come back, if at all,'" Zimmer-Myer says. "And it's actually been the reverse. 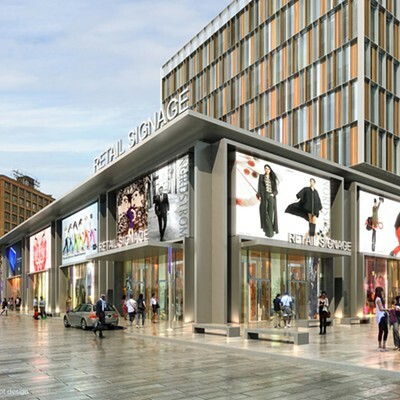 The retail has been very much later, although that's starting now, too." Windstream built its new headquarters downtown. And fast-growing, creative-class companies such as D4, Brand Networks, and CGI Communications are coming back to the city, Zimmer-Myer says. 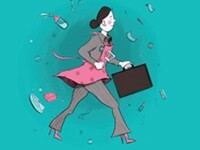 "All three of them are young, entrepreneurial kinds of companies," she says. "And they're growing by leaps and bounds. CGI, for example, is taking over almost the entire building. And they're hiring 100 people this year." 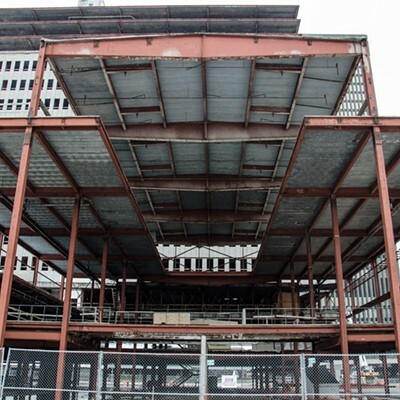 From the intersection of East Broad and Chestnut streets, you can peer through the rusty steel skeleton holding up what used to be Midtown tower. The massive 17-story structure is a ghostly reminder of the Midtown Plaza complex. 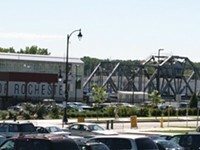 The gutted tower, with its weathered brick facade, is surrounded by a chain-link fence dotted with no trespassing signs. It looks as if it's being stripped for scrap materials, but the reality is that its next life is about to begin. The Tower at Midtown is a joint venture of Buckingham Properties and Morgan Management, two of the area's most established real estate development and property management firms. The tower will be a mix of office, retail, and mostly market-rate housing, says Larry Glazer, CEO and managing partner of Buckingham Properties. The first three floors, roughly 160,000 square feet, plus a small addition, will be devoted to retail and commercial office space. 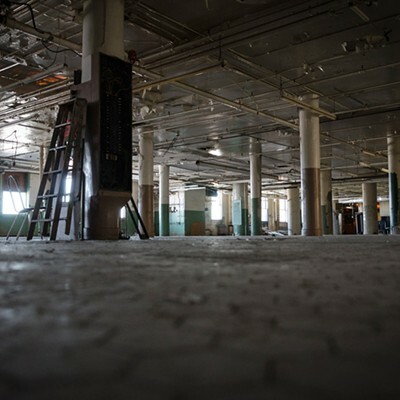 The remaining floors will be converted to about 180 apartments composed of studios and one- and two-bedroom units. Glazer says the units will be wired for Wi-Fi. Some units will have their own laundry hookups and there will be shared laundry facilities and a dog park. Two-bedroom units will run about $900 to $1,200 a month, Glazer says, and all units will include water, heat, and parking. The tower will have more than 400 underground parking spaces and tenants will be able to use an elevator inside the garage to get to the tower. Craig Jensen of Chaintreuil Jensen Stark Architects is the lead architect on the $55 million project. Work on the tower will begin next month, Glazer says, and take about a year to complete. Glazer says he's still working on what type of retail might occupy space on the ground floor, but he doesn't want anything too high end. He says he's considering everything from restaurants and small grocery stores to clothing and gift boutiques. "It's like putting a jigsaw puzzle together," Glazer says. Glazer is also trying to bring a movie theater to the Midtown site. It would be located on a portion of the tower's lot and a portion of the adjacent lot, he says. 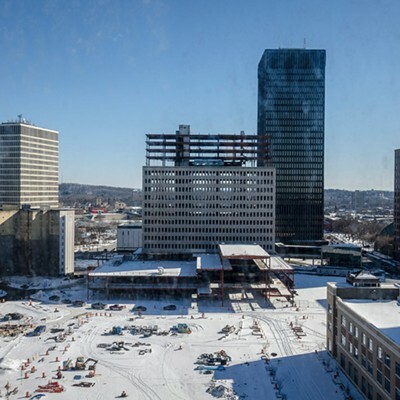 Though the tower lacks the Sibley building's historical cachet, it still captures the attention of Rochesterians with fond memories of Midtown Plaza, says the RDDC's Zimmer-Meyer. 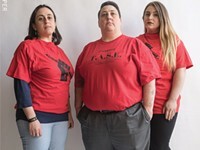 "Anything connected with Midtown has a strong emotional resonance with people here," she says. And the building will have another selling point not often associated with residential properties in Rochester: fabulous views. In larger cities like New York, Chicago, and Toronto, tenants pay more for apartments on higher floors. Comparatively speaking, she says, the Tower at Midtown will offer tenants a lot for their money. Some apartments will have views of the Genesee River, Lake Ontario, and the hills south of the city. 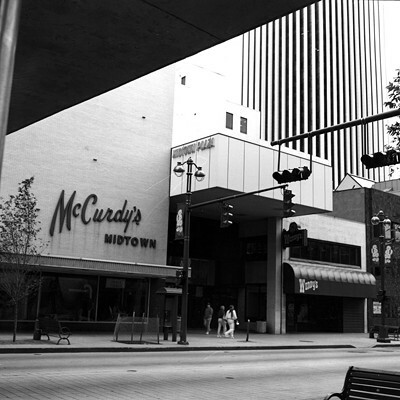 The Midtown Plaza complex of retail shops and offices, which included the tower, occupied seven and a half acres from East Main to East Broad streets. 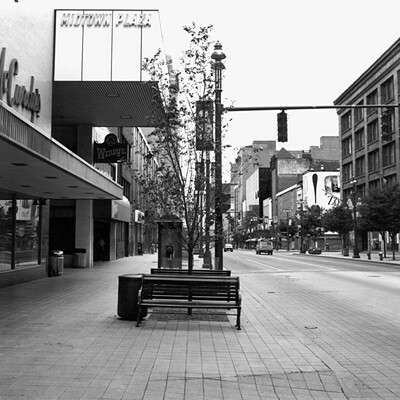 It was part of a campaign launched in the late 1950's by Gilbert and Gordon McCurdy and Maurice and Fred Forman to reinvigorate downtown. 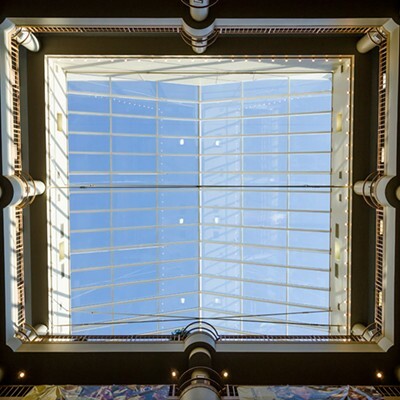 Architect Victor Gruen was brought on board, according to Karen McCally's "Rochester History – The Life and Times of Midtown Plaza." Gruen, often cited as one of the most influential architects of the 20th century, was a central figure in environmental architecture. The movement stressed design that embraced social interaction and pedestrian-friendly streets. 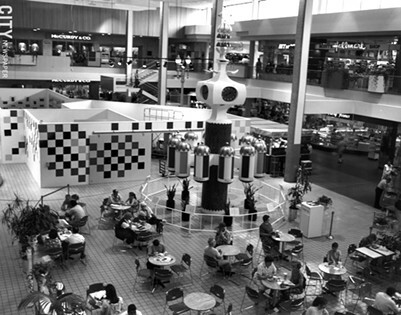 For most Rochesterians, the water fountain, Clock of Nations, and cluster of finer stores defined Midtown Plaza during its heyday in the 1960's and 70's. Though there was resistance to the plans to demolish the plaza, the public was less vocal about saving the tower. But Zimmer-Meyer says reusing the building makes good economic sense. "It's a good investment," she says. "Just consider the cost of steel alone." 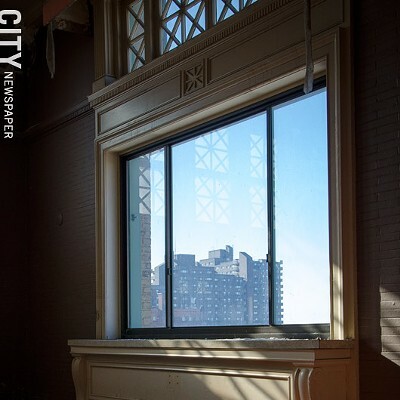 Making use of the city's older buildings makes sense in the long run, she says, because the ability to recreate high-rise buildings like the tower is limited. 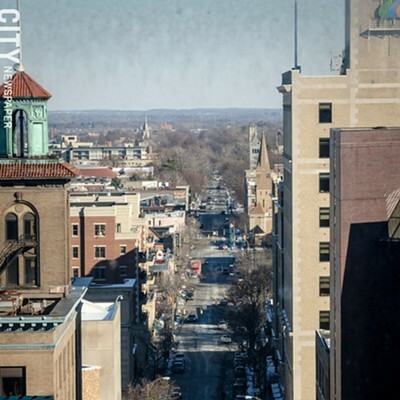 For many years, Sibley and Midtown have been monuments to what downtown Rochester has lost: population, retail, jobs, and the feeling of a vital, vibrant place. 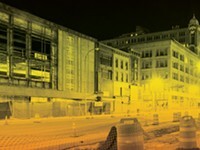 That is changing, Zimmer-Myer says, and Sibley and Midtown are part of the vanguard of that transformation. But people have to let go of their attachment to what downtown used to be, she says, because that's never coming back. There are a lot of different pieces in motion downtown, she says. The nearly 200 apartment units in Sibley and about 180 in Midtown tower, coupled with the units in the Temple building, University Place, the Michaels-Stern lofts, and other housing developments will mean serious density downtown, Zimmer-Myer says. "That's a lot of people within a few blocks," she says. "That creates a kind of momentum." Population density attracts retail, she says, and ground-level retail is planned for both Sibley and the Midtown tower. First the first time in 30 years, Zimmer-Myer says, a critical mass of retail in the area of Sibley-Midtown looks possible. Add to that a downtown worker population of nearly 50,000, she says, and you've got the pieces for an exciting transformation. "When you combine all those things, now you're talking some serious density," Zimmer-Myer says. "It feeds on itself and builds. And I think that's the era we're now in." "In five years, even three years, if you stand in the middle of the Main and Clinton intersection, you will not recognize where you are," she says. "Already now you can walk around during the day and see people in their sweats walking their dog. And you're going, 'Whoa, where'd these people come from?' They live here." Eddy, from WinnDevelopment, says he knows that there's a lot more riding on the successful redevelopment of the Sibley building than saving an old building. "You love taking on a project like this, which is going to be so impactful to the community," he says. "You're really changing a whole city, and you get excited about it."